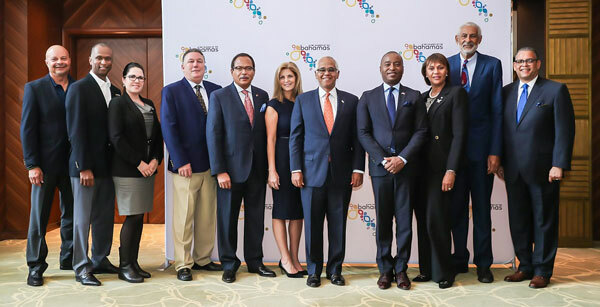 From ( L-R): Deputy Director General, BMOTA, Ellison Thompson; Senior Director for Canada and China, BMOTA, Paul Strachan; International Marketing Manager, Baha Mar, Ana Lidia Cerna; Director, Majestic Tours, B.J. Saunders; Russell Miller, Senior Vice President and General Manager with responsibility for the Cove and Reef properties; Wendy Blaney, Sr. Vice President of Sales for Atlantis Resort; Minister of Tourism and Aviation, the Hon. Dionisio D’Aguilar; Minister of Foreign Affairs; the Hon. Darren A. Henfield; Director General of Tourism, Joy Jibrilu, His Excellency Sterling Quant, Bahamian Ambassador to China; Robert Sands, Sr. Vice President of Administration and External Relations for Baha Mar.